If you are passionate about American history, you can make a lasting impact at the nation’s history museum through a planned gift. Our expert staff members are available to assist you in crafting a planned gift that maximizes your philanthropic impact while providing benefits to you in your lifetime. A planned gift can support the Museum’s broad array of activities, or can be directed to one particular area of interest. Are you inspired by presidential history? A proud veteran with a passion for the military? A devoted fan of popular culture? Or an advocate for K-12 history education? Whatever your interest, a planned gift can be designed to support it. With a gift of $50,000 or more, you can establish the ultimate legacy—a named endowment to provide funding for the Museum and its activities in perpetuity. Endowed opportunities are available for any area of interest at the Museum. When you commit to a planned gift, you become a lifetime member of the Smithsonian Legacy Society and the National Museum of American History’s Star-Spangled Banner Society. You will be among the first to learn about new exhibitions, programs, and events at the Museum and will be invited to VIP events and donor receptions. With documentation of your gift intention—revocable or irrevocable—you also will be recognized as a major donor in your lifetime. For more information, contact Stephanie Johnson at email or (202) 633-0398. 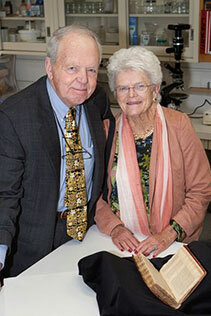 As founding members of the Smithsonian Council for American History, the Grants were inspired to create the Peter and Rhondda Grant Conservation Endowment after contributing to conserve the Jefferson Bible. Learn more about their gift.